New state data showed a large number of high school graduates in Tennessee entering college are not ready despite a growing attendance. 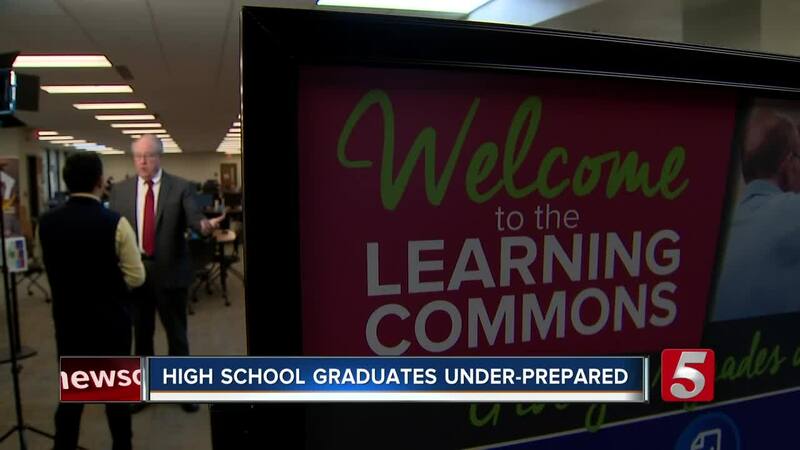 NASHVILLE, Tenn. (WTVF) — New state data showed a large number of high school graduates in Tennessee entering college are not ready despite a growing attendance. At the Senate Education Committee meeting on Wednesday, the Tennessee Higher Education Commission revealed the report that reviewed only students who were in community colleges and universities. Chief Policy and Strategy Officer Emily House said one-third to nearly half of students who entered public colleges needed remedial classes in math and reading in the 2016-17 school year. A student needs remediation if they scored an ACT score of 18 or below in those subjects. The recent data comes amid more students getting to college for free with the help of Tennessee Promise and Tennessee Reconnect. However, House suggested not everyone may be completely ready. "Since the implementation of Promise, the college going rate has increased, and many more students who perhaps may have not enrolled in higher education did so, that's a very good thing," House told the committee. "The academic profile in those ACT scores of those students, however, was a bit different than what it was prior to Promise." The report brings up questions on how to better improve the education system to fully prepare students if they pursue higher education. However, only about 45 percent of Tennessee college students graduate from state two- and four-year public colleges and universities within six years, according to a report from the State Collaborative on Reforming Education (SCORE). "Access doesn't meet success," said State Education Committee Chair Senator Dolores Gresham, R-Somerville. Shelby and Davidson counties had the most severe numbers. Shelby County sent students to colleges with 58 percent of them needing help in math and 41 percent for reading. State Senator Brian Kelsey, R-Germantown, was astonished to learn three high schools in his district had a 100 percent rate for remedial classes in math. In Davidson County, 62 percent of high school graduates needed remedial classes in math, 47 percent for reading. Whites Creek High School had the most with 91.7 percent rate in math and 77.8 percent in reading. It is followed by Maplewood High School with 90 percent in math and 76.3 in reading. "It was not a shocking number," Volunteer State Community College President Jerry Faulkner told NewsChannel 5. "It is a continuing chronic issue that we've not been able to fully solve." Volunteer State Community College helps students by accompanying credited classes with what is called a "Learning Support" course. The school had 48 percent of students who graduated high school, including GED recipients, needing the course. The student population is about 9,000. "I'm really bad at math, I really struggled my freshman year and didn't prepare for college. I had to take an extra math class, and it helped me learn how to do math and think more critically," said student Hannah Levering. "We as colleges have a responsibility to work with our K-12 partners to help them prepare the students that come to us," added Faulkner. Faulkner said while there is room for improvement, there are options to help students start their college career including the Seamless Alignment and Integrated Learning Support (SAILS). The program allows seniors in high school to take remedial courses before they get to college. SCORE has set four priorities to improve education like calling for better coordination between K-12, higher education and workforce development at the state and local levels and more options for career exploration and work-based learning across the state. President and CEO David Mansouri said, "SCORE sees an urgent need to better prepare Tennessee students for college and career. This week we called for redesigning high schools to give all students more challenging, relevant courses and personalized college and career advising. Parents need to know if their child is on track to be ready for the demands of college and the workplace. Improving TNReady test administration must be a priority because grades and diplomas do not tell the full story of student readiness for success after high school." The Tennessee Higher Education Commission plans to share the data with superintendents and districts.